Alfred's Advanced Preferences allow you to further tweak how Alfred behaves or presents results. Generally, it's unlikely that you'll need to make changes here, but we've provided details for you if you're feeling curious! On rare occasions, macOS may fail to update its metadata index correctly or the index may become corrupted. Rebuild your index if Alfred cannot find applications or files. It will open Terminal and run mdutil to rebuild your metadata index. Note that this may take over an hour. If you can't find files, take a look at the Indexing troubleshooting page for more detailed steps. 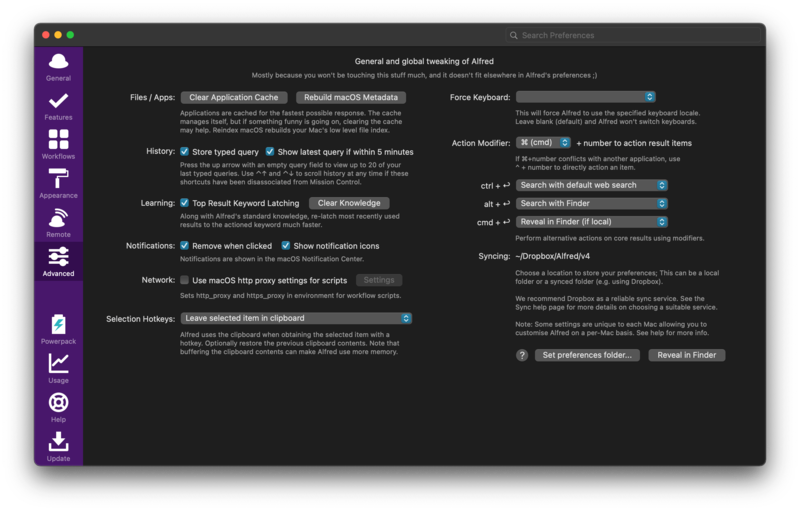 You can also clear Alfred's application cache (which you can also do by typing "reload" into Alfred), and tweak fuzzy matching settings for applications specifically. Check "Store typed query history" if you'd like Alfred to remember the latest 20 queries you typed. To automatically show the latest one if you pop up Alfred within 5 minutes of your last query, check the "Show latest history if within 5 minutes" box. You can force Alfred to always use the same language input source, if you use multiple languages on your Mac. Take a look at this detailed troubleshooting page for help using multiple input sources. You can specify what alternative action Alfred will perform if you press a modifier key like Ctrl, Alt and Cmd before pressing the Return key. Learn how to make the most of action modifiers with our tips & tricks. If you use more than one Mac regularly, you can sync to Dropbox to keep most of your settings in sync between your Macs. It's also a convenient way to keep your Alfred settings backed up online. See the detailed tutorial on syncing your Alfred settings using Dropbox for steps on setting up syncing on your Macs.